For this installment of Work of the Week, we are featuring three great projects. The first is an annual report for Robin Hood Foundation, an NYC-based non-profit organization focused on helping the poor in its local community. We also are featuring long-time partner PGi. Our teams collaborated to create an infographic about productive teamwork in the workplace. Lastly, we’re excited to showcase an infographic we just completed for Sprinklr about the shift in customer experience. 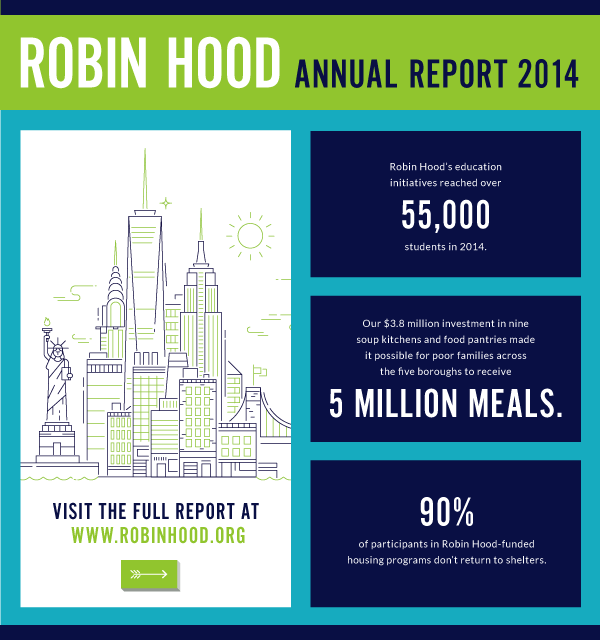 Robin Hood Foundation (RHF) is New York’s largest poverty-fighting organization. Since 1988, RHF has focused on finding, funding and creating programs and schools that generate meaningful results for families in New York’s poorest neighborhoods. We teamed up with RHF to create this interactive annual report to showcase RHF’s impact on NYC over the last year. With a collaboration market projected to reach $33.8 billion in 2018, technology reigns supreme in today’s teamwork-driven workplace, helping connect more employees than ever before, as businesses go global and employees work from anywhere. We partnered with PGi to tell the story of business collaboration in a unique way that would resonate with its audience. Social media is one of the best places for brands to connect with customers in a meaningful way and create positive customer experiences. In fact, 47% of Americans say Facebook is their #1 influencer of purchases, while 63% of millennials say they follow brands on social media. To breathe life into this new data, we created an infographic to help users understand and digest the information in a visual manner. Want more on creating great content marketing? Find out how to get the most mileage from your content by Maximizing Your Publishing with Microcontent. Learn everything you need to know about visual content in The Ultimate Guide to Visual Content Marketing. Get the most eyes on your content by reading The Ultimate Guide to Content Distribution. Of course, if you need a little help with your content, we’d love to chat.